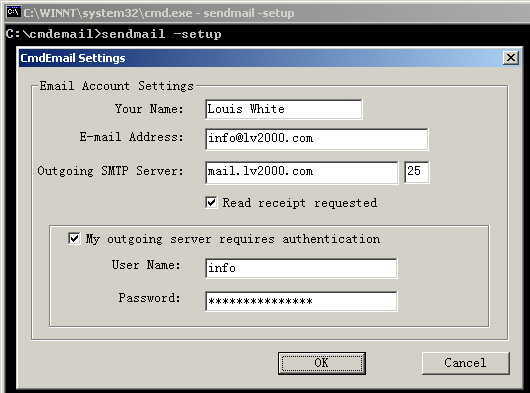 CmdEmail is command line e-mail component, it can be integrated into application that developed by multiple language. This article demonstrate how to integrate CmdEmail into oracle forms, enables oracle forms to send rich formated e-mail. Note: Since CmdEmail require Windows platform, if your forms is not running on Windows server, this article may be useless for you. 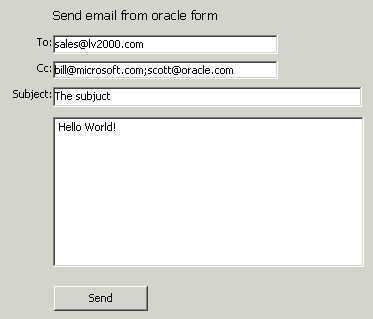 There several ways to send mail through oracle forms. In this page, we only introduce the last way, a simple and effective way to send email through oracle form, using the CmdEmail send mail component. If you want to try other solutions, please refer to documents of Oracle Forms or search google for related topic. CmdEmail support command line interface, you call the program through command line. Supposed you have configed the program, you can send e-mail to somebody just use a dos command. e.g. The CmdEmail read the e-mail addr. of recipients, and then send a blank message to the recipients. The recipients scott@tiger.com (if exists) will receive a mail sent from you. Need to specify the subject and mail body? Okey, please create a message file and pass the file path to CmdEmail . The messae file includes two parts, header and body. Header : Specify the recipients, subject, location of attachment etc. Body Text: The content of the email. Save the text above to C:\temp_name.txt . Run CmdEmail again, e.g. CmdEmail will read information from the message file, then send a mail to sott@tiger.com, copy to bill@microsoft.com. Decompress installation pack to the folder where you want to install the application files. We suggest you to install CmdEmail to windows PATH so that it can be called from any current working directory. Setup your default email account settings. The CmdEmail Settings dialog will appear.Please input the information given to you by your Internet Service Provider (ISP) or administrator. Your Name: Friendly name of the addresser. Your email address: The addresser of the mail. Outgoing SMTP server: Please refer to your ISP or network administrator. Read receipt requested: For MS outlook only. User Name: User name used to login the smtp server. Password: Password used to identify the user. Note: Unless your ISP have indicated that your service uses Secure Password Authentication, do not select the "my outgoing server requires authentication" check box. Please do some testing after setting e-mail account. Please use CmdEmail to send a mail manually. You can call CmdEmail from oracle form through HOST built-in. --How to create message file. Please use TEXT_IO to create the message file. --How to call CmdEmail. Please use HOST procedure to run CmdEmail. text_io.put_line(text_file,'delete_the_file:yes');--delete the message file when the mail is sent successfully. If you the mail is not sent to recipients, CmdEmail will log the error message to this file: smerror.log , please open the log file via notepad.exe and view the error message. Feedback, questions and bug reports are welcome and should be sent to the customer support, at support@lv2000.com. Purchase Mail Later online through a secure server with any major credit cards. ©2007 Lion Soft Ltd. All Rights Reserved.